Forms and flyers are included! Great marketing tool that patients talk about! **Only want the Forms and Flyers? Click to purchase & download forms and flyers only. ***For corrective posture protocols, view the Posture Exercise Rehab Protocol Set. Good guide to getting your feet wet with a postural program. Preset forms that require only adding name and address. Very helpful, recommend it. I was looking for free posture assessment forms and came across this book. Not free, but was a good deal and came with the assessment for i needed, and an intake form, and the bonus of a few marketing flyers. Pretty good material in the book with a starting off point for brainstorming networking synergies. I bought this book for the forms. Forms are helpful, pdf format to add business contact info. Also had a couple flyers I didn't expect that are prefilled - but you can change. I know how to assess posture pictures already, however did find the info helpful when it comes to relaying findings to people with limited knowledge of anatomy. Happy with this purchase. I just start to use the forms, and I have not yet printed the flyers. So far the form is very easy to use. I like it very much. Used the forms and ideas in the book to set up a posture analysis screening at a gym. Referral from gym set up screening at ATT. Referral from ATT gave me a contact for a women's tennis group. GOOD ideas in book, great forms, grid was perfect and easy. I'll let you know how i keep the ball rolling. Practical posture analysis information, as quick or in depth as you want to get. Good sections on the place of posture in health/fitness industry, practical assessment, protocols for posture pictures and posture analysis. Ideas for where to market your posture analysis screenings, also lots on the principles of posture. Includes a couple assessment forms and marketing brochure flyers to download, edit and use. Good job! Am pleased to have received a review copy. Thank you! 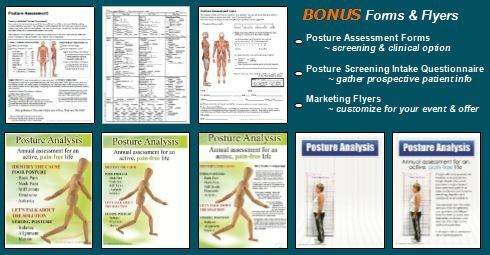 Click the button below to add the Posture Pictures Assessment Forms and How-to Book to your wish list.